Perhaps King knew that our own as well as our children's freedom depended on all of us finding our lost sisters and brothers, discovering our real purpose in life. Perhaps he also knew that it was only in such struggles for our multi-racial, democratic family that we ultimately discover and develop the true content of our character on a personal and national level. Perhaps indeed, Rabbi Heschel was opening such truth, such struggle, such challenges to us all when he later declared that "The whole future of America will depend on the impact and influence of Dr. King." 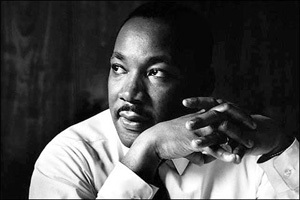 So as we teach our children (and ourselves) to prepare for active, costly, thoughtful participation as creative citizens of a multi-racial, democratic, national family, we are compelled to go with King to his deepest levels of hope and struggle, to delve into the transformative possibilities of his dream. As we engage with a world community seeking to rediscover its post-industrial purpose and direction on an endangered Mother Earth, we do well to remember King's call for compassionate, life-giving "soul force" to replace our own long, crippling dependence on extractive force and death-dealing military power, from the "rockets' red glare" to this seemingly unending time of "shock and awe." Let us instead stand quietly in awe of life itself and of our great national and personal potentials for sharing, building, enhancing life. Perhaps we shall then discover not only the content of our character but the deepest meaning and purpose of our freedom, constantly singing with King, and with all the other known and unknown continuing creators of our forever emerging nation, "Free at last, free at last; thank God Almighty, we're free at last." And even as we sing, we remember in our ears and in our hearts the sound of the bombs exploding in the Birmingham Church, taking the lives of the young girls, just weeks after the great March. And we know as well that the martyrdom of Medgar Evers and of John F. Kennedy before the year was over were all part of the drama on the mall. And still we sing together. And still we work together. For that unyielding determination to bring a new nation to birth is surely the best measure of the content of our character, and the best sign of the impact and influence of Dr. King. Now, a final, loving word to my dear friends, the teachers everywhere: Please be sure to ask your students what freedom means in 2010 -- for children, for adults, for the American nation, for the world community. And perhaps you might let them hear your own answers, your own dreams. What a beautiful exchange! Perhaps we all may even discover the meaning and power of "soul force" in the 21st century. What a great promise! Fannie Lou, Ella, Martin, and Dr. Thurman -- do you see us? We're on our way. And we won't turn back. Vincent G. Harding, professor emeritus at Iliff School of Theology and co-founder of Veterans of Hope Project, is a historian, author, and activist. Read his full article on the legacy of Dr. Martin Luther King in this month's issue of Sojourners magazine.